A spectacular ceremony honoring the best of the best of the vibrant Asia & Australasia region takes place this weekend on October 15 at the luxurious five-star InterContinental Danang Sun Peninsula resort. This is where the World Travel Awards Asia & Australasia Gala Ceremony 2016 will take place at its venue in Vietnam. The great and the good of the region's travel industry, the top brands and companies, will all congregate at this amazing venue to receive the accolades of the global traveling public. This 2-day event kicked off today, Friday, October 14, with networking welcome drinks, and on Saturday, the evening will start with a cocktail reception followed by the exciting Gala Dinner and Ceremony. Danang is a bridge of economic, cultural, political, and social life in the middle and Central Highlands of Vietnam. Danang city has an international airport with many direct flights, a deep sea port, and the national North-South railway system of Vietnam. Danang offers amazingly beautiful destinations, especially Danang beach. Visitors may admire the natural wonders in Ba Na Hills, do some jungle exploring in Son Tra Peninsula, pray at Linh Ung Pagoda with Vietnam's highest Bodhisattva Statue at 67 meters, and visit the Museum of Cham Sculpture, where the antique statues of Cham culture are preserved and on exhibit. Nestled in the hills of the famous Son Tra Peninsula, just a short drive from three UNESCO World Heritage sites, the truly iconic, 200-bedroom luxury Danang resort, designed by Bill Bensley, features exclusive beachfront villas with private pools. 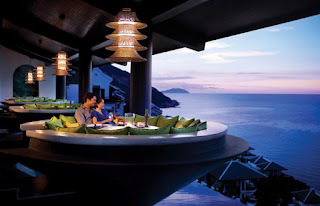 Guests have the opportunity to savor fine cuisine at La Maison 1888 by a three-Michelin-starred Chef, Pierre Gagnaire; relax in exquisite suites overlooking panoramic ocean views; unwind at the award-winning HARNN heritage spa; and enjoy signature cocktails at the beachside bar.